Heat frosting in microwavable bowl uncovered on High 30 seconds, stirring every 10 seconds, until frosting can be stirred smooth and fluid. Each tree will be a stack of 8 different size cookies. 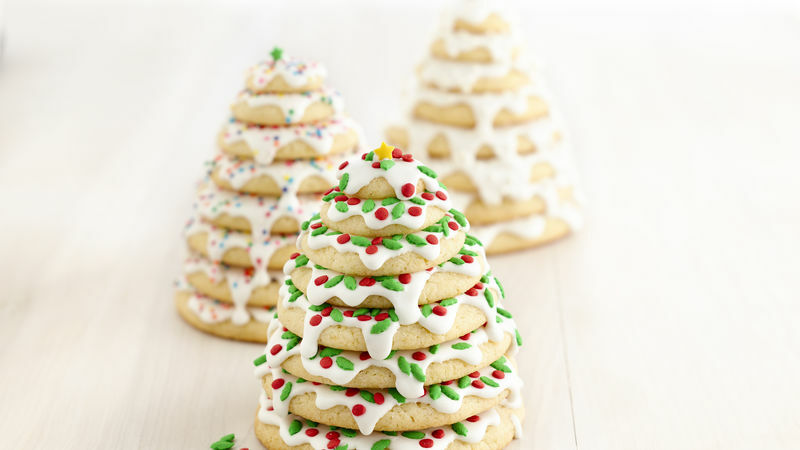 To assemble 3 trees, stack cookies on serving platter, starting with largest size cookie on bottom, and stacking each smaller size cookie on top, spreading frosting between each layer. Drizzle remaining frosting over trees, and garnish with sprinkles. Sprinkle icing sugar on platter to look like snow. Any flavour Betty Crocker cookie mix can be used in place of the chocolate chip. Make dough according to package directions. Bake times may vary, watch the cookies closely as they bake.